The Dinner Wars – and How to Win Them! Oh toddlers – they are a mysterious bunch. One day, Emma Ramey wants to eat everything in sight. The next, she acts like I am trying to poison her. I quickly figured out that making food kid-friendly is essential in getting my child to eat. That’s what is so great about my recent discovery – the Campbell’s Kitchen Food Kids Love page. Seriously, if you have a picky eater at home (young or old), check this one out! This has a huge collection of easy, kid-friendly, and inexpensive recipes – things like Mini Cheesy Chicken Enchiladas, Taco Mac and Cheese Cups, and Buffalo Chicken Casserole – yum! 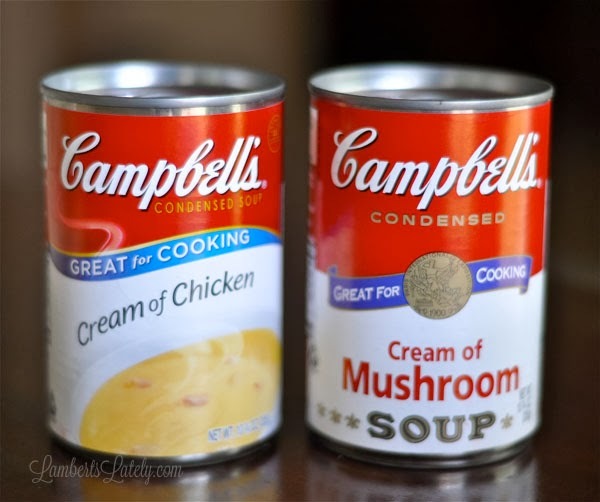 I love that some of these recipes use Campbell’s Great for Cooking soups, like Cream of Mushroom and Cream of Chicken, to create fun recipes that sneak in those essential daily veggies. There are even fun new ideas on how to eat the Campbell’s classics you probably loved as a kid, like Campbell’s Tomato Soup. It’s a great resource for mommies and daddies everywhere! One of my favorite things about this site is that the recipes are so versatile. I tried out the Mini Chicken and Stuffing Cups, but added my own twist to it, since my family loves green bean casserole during the holidays! Here’s my version. Preheat oven to 350 degrees. Place 12 muffin liners in a muffin pan. Mix chicken, stuffing mix, green beans, soup, and cheese. Spoon mixture into each muffin cup and level each cup off with a spoon. Bake at 350 degrees for 35-40 minutes, until the tops of each cup are slightly brown and crispy. Top with cranberry sauce as desired. I served this with sweet potato casserole, to give it that full holiday meal effect. So yummy…so easy…and so delicious! Noah raved over this recipe, and more importantly, Emma Ramey actually ate it…green beans and all! For more than 144 years, Campbell’s has been making that everyday meal fun and delicious, and they continue to come up with fabulous new ideas. A big thanks to Campbell’s Kitchen for giving me creative twists on classic recipes and totally new ideas to try!